I have previously written how smart a certain young Korean golfer had changed her first name to Birdie. So now everyone on the tour knows Birdie Kim and no one mixes her up with all the other Kims. Plus what could be more of a daily inspiration where golfers go out and try get birdies on every hole. Tiger Woods of course is very appropriate for a golfer- and he knew it early on – which is why his nickname has become his real marketing and persona name. I used to think Tiger was his middle name, as many have reported, but see now that his full legal name is Edridge Tont Woods. From the Olympic Games in London, Jimmie Fallon has commented on how Dang Dang is the perfect name for a trampolinist. 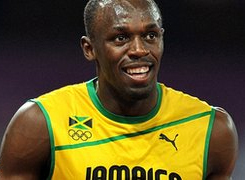 But nothing matches Usain Bolt as an appropriate name for the world’s fastest sprinter. Imagine how insane this would be if he actually ran for the USA?